Spring & Summer Programing & Membership Registration Now Posted! Katie has been rowing for 16 years starting as a novice at Farmington High School where, as a senior, she was a girls team captain. She went on to row at Mount Holyoke College and was a 2 time recipient of the Holly Metcalf Team Award, awarded to a team member dedicated to the pursuit of excellence in rowing. 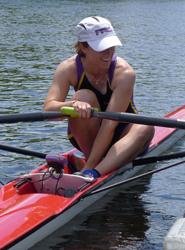 She was also named a Collegiate Rowing Coaches Association National Scholar Athlete in 2007. Katie continues to row competitively as part of the FVRA racing team. She won a silver medal in the 2016 Masters Nationals in the Mixed A 2x event. She is a certified USRowing Level 2 Performance Coach. Her primary coaching focus is in sculling but she also works extensively with the FVRA sweep programs. She has also coached at Craftsbury Sculling Center in Craftsbury, VT. Katie believes in the “holistic” approach to coaching – taking into account both mental and physical aspects of the sport. Outside of FVRA she is a graphic and web designer who loves gardening and hanging out with her chickens. 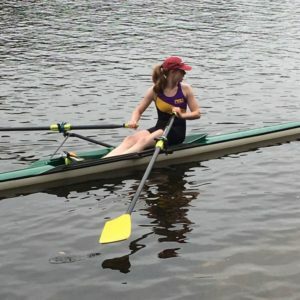 Kirsten Preskenis has more than a decade of rowing experience at the high school, college, and master levels. In addition to coaching with FVRA, she is also the Junior Varsity Men’s Coach at Farmington High School. Kirsten began her coaching career at her alma mater, Stony Brook University, where she led the novice team before taking over as head coach. Prior to coaching, Kirsten rowed for Stony Brook’s varsity team for four years and held several leadership roles on the team’s student executive board. Kirsten also rowed for four years at Simsbury High School, where she earned a state championship. She continues to row competitively with FVRA, where she also serves as the team’s Vice President. Kirsten loves developing fast, competitive boats while instilling values like accountability, teamwork, and good sportsmanship in her rowers and coxswains. Ryan started rowing with FVRA in 2012 as a sweep rower with the Men’s Racing Team. Since then he has switched his focus to sculling – competing in singles and doubles – most recently he won a silver medal in the Mixed A 2x event in the 2016 Masters Nationals in Worcester, MA. He has an extensive background in adventure education having worked with climbers, bikers and boaters all over the country. He is currently an elementary school Special Education Teacher. As part of FVRA Ryan is also the Men’s Racing Team captain. 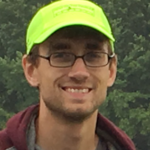 As an assistant coach Ryan works with intermediate sweep and can also be scheduled for private sculling lessons.